This applicaton note applies to Mark 2 Pro-120 controllers only. The Pro-120 has an expansion connector that may be used to connect a master controller to a single slave. Connecting to more than one slave would be possible – but the extra loading means that full speed is not attainable. This can be overcome by reducing the value of a resistor on the controller that is to be the master. This resistor does not need to be changed on the slaves. 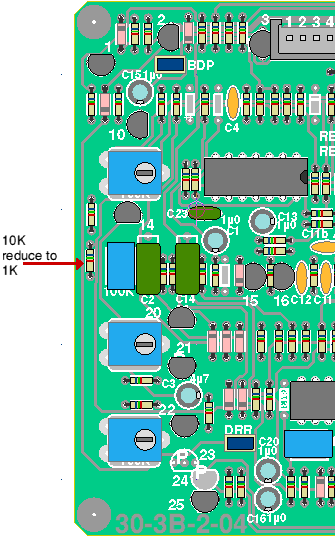 The resistor is currently 10K it is probably easiest to reduce it to 1K – or simply solder a 1K resistor across it on the back of the board. The resistor is shown in the diagram, right. This can be done by anyone competent to solder but be aware that 4QD will take no responsibility for and damage incurred by this modification. Earth fuses – why do they blow relevant because slaving controllers thus introduces earth loops.